Aim Researchers have begun to examine work engagement in nursing, but there is little research specific to work engagement in emergency department (ED) nurses. The erratic nature and increased requirements of EDs adds to the burden on leaders to meet patient demands while keeping staff engaged. The aim of this pilot study was to describe and explore the relationship between levels of ED registered clinical nurses’ (RNs) work engagement and age, years of experience and shift worked to determine if there are differences between ED nurses and those working in other areas and whether this information could help ED leaders in their approach to staff engagement. Method A descriptive pilot study was used with RNs from a Midwestern urban level 1 trauma ED in the US. Participants completed an electronic survey that included demographics and the Utrecht Work Engagement Scale (UWES). Findings Participants had a Bachelor of Science in nursing or higher and 62% had five years’ or less nursing experience. UWES scores compared to national benchmark scores were average and Cronbach alpha coefficients were 0.90. Reliability for each subscale differed. Analysis found no significant difference in relation to age. Conclusion Participants scored high in total engagement with absorption ranking highest. 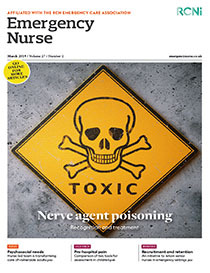 Evidence reinforces the need for leaders to develop positive relationships with novice nurses to foster engagement and increase tenure.